The Lockheed Martin F-22 Raptor, the world’s first ever fifth-generation fighter, is still widely considered to be not only a superior dogfighter to the F-35 Joint Strike Fighter but likely, the most capable air superiority fighter on the planet. Its unique combination of stealth characteristics, speed, and maneuverability set it apart from acrobatic fourth-generation fighters and stealthy fifth-generation platforms alike, but that doesn’t mean there isn’t room for improvement. While the F-35 may not be able to a match its older sibling in speed or maneuverability, Lockheed developers believe it retains its place as the world’s most capable aircraft thanks to its improved stealth and its targeting system’s massive field of view. Further, the F-35 was purpose-built to serve as a data hub, absorbing targeting information from any number of assets and using it to develop what may be the most robust level of battlefield awareness any fighter pilot has ever had. The F-35’s purpose isn’t limited to air-interception but also includes a wide variety of roles. If it founds itself facing off against particularly squirrelly fighters like Russia’s Su-35 or China’s J-20 (based on stolen F-22 designs), it would likely engage the enemy aircraft before they ever knew it was nearby–and if it couldn’t, it would bug out to avoid a head to head conflict. Now, however, the U.S. Air Force is looking to bridge that operational gap between the F-22’s nimble quickness and the F-35’s super-computing stealthiness. 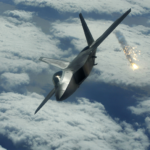 A new slew of offensive weapons and system upgrades now promise to offer the F-22 a broader targeting envelope and greater battlefield awareness, all while retaining the advantage in speed and mobility. Two new weapons purpose built for long range engagements (the AIM-9X air-to-air missile and the AIM 120-D), a new two-way data link apparatus that will allow for “collaborative targeting,” and sensor upgrades now promise to bridge some of the gaps between the F-35’s brains and the F-22’s brawn, and potentially propel the Raptor even further ahead of its competition. Soon, F-22s will be able to identify and target enemy aircraft using data provided by any number of airborne, ground-based, and satellite assets long before the bad guys are even aware of their presence. They could engage other planes from beyond the horizon, or use their superior speed to close with an intercept if need be. While dog fights might make for good movies, when it comes to actual air-to-air engagements, shooting the enemy down before he’s even aware of your presence is always the preferred outcome. That would give America’s small fleet of F-22s (fewer than 180 currently operational) similar capabilities to the newer F-35, and quite possibly remove a bit of its luster as Lockheed attempts to sell both Japanese and American governments on the idea of a new hybrid platform that combines an F-22-like airframe with the F-35’s advanced technology. If these F-22 upgrades prove successful, it may pave the way for progress in that endeavor. According to Ken Merchant, Lockheed’s vice president for F-22 operations, these upgrades will combine into something greater than the sum of their parts, offering the F-22 unprecedented targeting ability in all engagements. In fact, the combination of advanced targeting systems and the new AIM-9X may even give the Raptor the ability to shoot down planes that are on its tail. “It is a much more agile missile with an improved seeker and a better field of regard. You can shoot over your shoulder. If enemies get behind me in a close-in fight, I have the right targeting on the plane to shoot them,” he told Warrior Maven this week. The F-22 may have already been the most capable fighter on the planet, but with this new slew of upgrades, it seems possible that any enemy fighters it engages may never know it. They’ll be gone before they ever get the chance to see it.